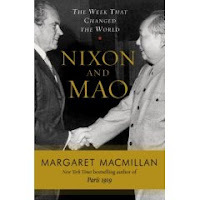 This week marks the 36th anniversary of Richard Nixon’s visit to China, so it was serendipitous that on meandering through the public library’s history section I happened on Margaret MacMillan’s Nixon and Mao: The Week That Changed the World. Largely a play-by-play examination of the week’s events (and its larger-than-life stars in Nixon, Mao, Kissinger, and Zhou Enlai), the book is littered with fascinating anecdotes about the China Nixon and his entourage encountered: for instance, Beijingers were ordered to studiously ignore the welcoming motorcade and Chinese pilots who took over Kissinger’s plane for the Shanghai-to-Beijing leg during his 1971 prepatory visit navigated visually, stymied by the plane’s up-to-date systems. MacMillan’s intricate accounts of the meetings between Chinese and American leaders are the most engaging parts of the book, but she does an equally good job of articulating Nixon’s reasons for seeking rapprochement with China, as Warren Cohen noted in his review in Foreign Affairs. (Other substantial and insightful reviews of the book include Roderick MacFarquhar’s review in New York Review of Books, Louis Menand’s in The New Yorker, and John Lewis Gaddis’s in the New York Times) Nixon’s decision to override American concerns with China’s “internal affairs” (re: Taiwan) in order to establish diplomatic and economic relations set the stage for a continuing tug-of-war between two poles who felt (and feel) that China foreign policy should be a way to convey American standards on everything from democracy to disease control, and those who believed dialogue and economic exchange would, of themselves, bring China in line with the world community. That battle is unresolved, making the full implications of Nixon’s visit yet unclear, but the struggle continues to manifest itself in popular swings bet ween an eagerness to engage with China and a fear of China’s growing power and, sometimes, markedly differing opinions on world events. In Britain, the book was published as Nixon in China, more accurately reflecting its American-centered perspective (MacMillan is a professor of history at Oxford University and her previous research has focused on the British Empire and modern international affairs). Chinese history asides may occasionally make China buffs gnash their teeth (for instance, a reference to the imperial tributary system as explanation for the Chinese government’s prickliness about whether China had invited Nixon or he had asked to come). While not groundbreaking in its presentation of China’s history during this period, Nixon and Mao provides a very readable overview of the American vision of China and its leaders and MacMillan’s research yields many new details about the week’s events. 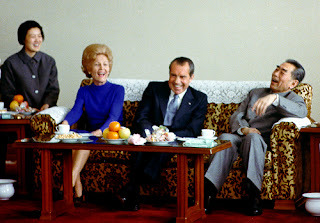 There are a number of internet resources that provide more information about the Nixon visit, including photos from the Ollie Atkins Photograph Collections (the above photo of the Nixons and Zhou is from this collection) and this recent piece about the death of Mao’s English tutor, who acted as an interpreter during the visit (and whom MacMillan interviewed for her book), in the New York Times. The amazingly complete transcripts of diplomacy in action make great reading. The National Security Archive at George Washington University has links to .pdf’s: Henry Kissinger's Secret Trip to China, The Beijing-Washington Back-Channel, September 1970-July 1971; “Nixon’s Trip to China,” Record of Richard Nixon-Zhou Enlai Talks, February 1972; Negotiating U.S.-Chinese Rapprochement New American and Chinese documention leading up to Nixon's 1972 trip.